Airline surveys on jet lag and Jet Ease. 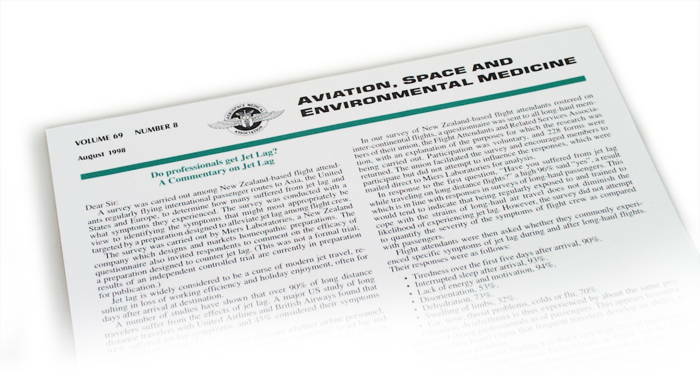 This survey was published in the Letters to the Editor section of the journal, Aviation, Space and Environmental Medicine. A survey was carried out in 1994 among New Zealand based flight attendants regularly flying routes to Asia, the United States and Europe, with the assistance of their union - F.A.R.S.A. They were asked how many suffered from jet lag, what symptoms they suffered, and whether Jet Ease was effective in countering them. Have you suffered from jet lag while travelling on long distance flights? How effective was Jet Ease in countering jet lag symptoms for you? Did you find Jet Ease effective in countering tiredness after arrival? Note: A US based survey found that 94% of long distance travellers suffered from the effects of jet lag and that 45% considered those symptoms severely bothersome. Full text as published in Volume 69, number 8, August 1998 edition of Aviation, Space and Environment Medicine (Official Journal of the Aerospace Medical Association). Do professionals get jet lag? A survey was carried out among New Zealand-based flight attendants regularly flying international passenger routes to Asia, the United States and Europe, to determine how many suffered from jet lag and what symptoms they experienced. The survey was conducted with a view to identifying the symptoms that might most appropriately be targeted by a preparation designed to alleviate jet lag among flight crew. Jet lag is widely considered to be a curse of modern jet travel, resulting in loss of working efficiency and holiday enjoyment, often for days after arrival at destination. A number of studies have shown that over 90% of long distance travelers suffer from the effects of jet lag. A major US study of long distance travelers with United Airlines and British Airways found that 94% suffered jet-lag symptoms, and 45% considered their symptoms severely bothersome (2). An objective of our survey was to ascertain whether airline personnel, who might be expected to have developed an "immunity" to jet lag and to be aware of practical methods to counter some of its effects, suffered the same symptoms as passengers. Disruption to circadian rhythms caused by crossing time zones, which can result in broken sleep, with the sufferer waking during the night and then wanting to fall asleep during the day. The number of days this dysrhythmia lasts has been observed to be about equal to the number of time zones crossed. A study by Air New Zealand states that passengers crossing 12 times zones on a 26-hour flight require ten days to re-establish a normal sleep pattern (1). Fatigue, lasting for days after arrival. This is often accompanied by a lack of concentration and motivation, especially for any activity that requires effort or skill, such as driving, concentrated reading or business negotiation. Disorientation and vagueness. Respondents in our survey mentioned, for example, having to return to their hotel room three times to check if they had left the door locked. Discomfort of legs and feet due to limbs swelling while flying, which in some cases can prevent travellers wearing their normal shoes for up to 24 hours after arrival. Dehydration due to the dry atmosphere aboard airliners, which can cause headaches, dry skin and nasal irritation. This in turn can result in a general feeling of unwellness and make the subject more susceptible to colds or other infections. The World Health Organization also cites jet lag as an aggravating factor in cases of diarrhoea caused by microbiological contamination of water or food, which it believes affects between 20% and 50% of travellers (3). Since the biggest single cause of jet lag is crossing time zones, which disrupts the body's circadian rhythms, the syndrome is most severely felt when associated with east-west, west-east or transpolar flights. The effects are made worse by variations in atmospheric pressure each time the aircraft takes off and lands, and also by pre-flight stress, tiredness or hangovers. Other factors that appear to exacerbate jet lag include the dryness of the air supply aboard passenger aircraft, the temptation to consume alcohol and to eat more than necessary during flight, and the lack of body movement, especially in the legs and feet. In our survey of New Zealand-based flight attendants rostered on inter-continental flights, a questionnaire was sent to all long-haul members of their union, the Flight Attendants and Related Services Association, with an explanation of the purposes for which the research was being carried out. Participation was voluntary, and 228 forms were returned. The union facilitated the survey and encouraged members to participate but did not attempt to influence the responses, which were mailed direct to Miers Laboratories for analysis. In response to the first question, "Have you suffered from jet lag while traveling on long distance flights?" a high 96% said "yes", a result which is in line with responses in surveys of long-haul passengers. This would tend to indicate that being regularly exposed to and trained to cope with the strains of long-haul air travel does not diminish the likelihood of experiencing jet lag. However, the survey did not attempt to quantify the severity of the symptoms of flight crew as compared with passengers. Tiredness over the first five days after arrival, 90%. Interrupted sleep after arrival, 93%. Lack of energy and motivation, 94%. Ear, nose, throat problems, colds or flu, 70%. Circadian dysrhythmia is thus experienced by about the same proportion of flying professionals as of passengers. This appears to contradict the often heard claim that frequent travelers develop an ability to overcome this problem. Another noteworthy finding was that a very high 73% of flight attendants experienced dehydration. Dehydration in flight can be largely countered by regular drinking of water (as distinct from alcohol, coffee, fruit juice, etc), and it appears the flight attendants had either not been told of this in training or were not following recommended practice. Also surprising was that 32% of flight attendants experienced swelling of limbs, a symptom generally attributed to passenger immobility during long flights. This may indicate that other factors such as changes in air pressure or dehydration contribute to limb swelling. In answer to the question "how effective was the homeopathic preparation, Jet Ease in countering jet lag symptoms," 75% of the 55 flight attendants who used Jet Ease said it was either good or very good in countering jet lag symptoms. 1. Petrie K, Conaglen JV, Thompson L, Chamberlain K. Effect of melatonin on jet lag after long haul flights. British Medical Journal 1989; 298:705-707. 2. The Upjohn Company. Tips for Overcoming Jet Lag (leaflet). Kalamazoo, mi: The Upjohn Co., nd. 3. WHO, Geneva. Safe Food for Travellers: WHO's Recommendations (leaflet). 28 June 1994.